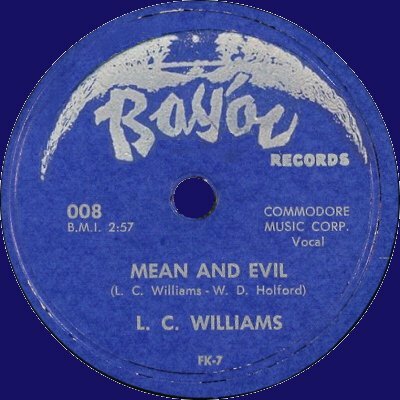 Today's spotlight on the Bayou label, an initiative of Franklin Kort, formerly a producer of several other West Coast labels - Recorded In Hollywood, Exclusive and Swing Time. It existed only a few months in 1953 until it was sold to Imperial. In this short time it brought us 18 records, among them several re-releases and remixes - indeed, though not very sophisticated, on several titles fragments of other records were joined together and some dubbed over with crowd noise. With instrumental honkers like Big Jay McNeely it's not difficult to understand that that was possible with the limited technology of the early fifties, neither with blues of Joe Turner, that consisted of loosely consistent classic blues verses. With that, Bayou was a quite unusual label for the time and also pretty low-level. Unfortunately for mister Kort, the records failed to sell and his label folded after a few months.